The coin is made from 0.900 fine gold with a weight of 1.2057 troy oz. I have several various coin sets, Gold, Silver, Worldwide, and from the Olympics as well! Currency 1821-1926 Coin 22K GOLD. Notes REAL GOLD COIN, coin in the picture is the actual item you will receive. Sorry for the inconvenience, but this is the LAW. You're dealing directly with the owner— a professional! © is one of the most important books of this century.”. 1923 50 Pesos Gold Coin. A 1957 50 PESOS ( HAS 1.2057 OZ. THIS IS A GREAT FINISH TO THE GOLD 1921 - 1947 50 PESOS COLLECTION. ). BIG gold coin. 1.2057 oz troy AGW. THE COIN YOU SEE WILL BE THE EXACT COIN RECEIVED. MULTIPLE PICTURES TAKEN FOR BEST EVALUATION. 1921 Key Date Mexico 50 Pesos Peso Gold NGC MS62 Free Ship THE KEY DATE!! KM-841 PCGS MS65. Better Dare, Rare in MS65. 41.67 Grams of. 900 Gold. BRIGANDI COINS & COLLECTIBLES. WE MOVED! THE COIN YOU SEE WILL BE THE EXACT COIN RECEIVED. MULTIPLE PICTURES TAKEN FOR BEST EVALUATION. THE 1ST FOUR PICTURES TAKEN UNDER ARTIFICIAL LIGHT AND THE LAST 8 PICTURES TAKEN IN NATURAL LIGHT. THIS COIN MUCH BETTER IN HAND AS IT HAS A HIGHLY REFLECTIVE APPEARANCE. It is composed of 1.2057 troy ounces of. 900 pure gold. The actual weight of pure gold within this coin is 37.5 grams. This coin was first minted in 1921 and was minted until 1947. The coin was restruck occasionally in later years but bears the 1947 date. KM-842 PCGS MS66. HIGH GRADE. Very Rare in a Grade this High. 41.67 Grams of. 900 Gold. Certification NGC. Grade MS 65. Composition Gold. Denomination 50 Pesos. Reno, Nevada 89502. 1280 E. Plumb Ln Unit C. Carson City, Nevada 89701. Now with three great locations to serve you! 1947 GOLD 50 PESOS SCARCE NEW DIE RESTRIKE PCGS MS69 TOP POP 1 GEM!! Look it up and check out the high resolution pics as it is an exceptional strike. You will see the difference of this coin as to any other! ULTRA FANTASTIC NEW DIE RESTRIKE With an exceptionally Nice Matt Finish Appearance! 1927 50 Pesos Gold Coin. make Supersized seem small. Get images that. Graded by PCGS as MS64. 41.666 grams of. 900 Gold. AGW = 1.2057 oz. A super nice gem gold 50 pesos coin with excellent surfaces/luster/strike. (a few light surface scratches on lens of case) . a premium example for the assigned grade ! Coin Contains 1.2057 Ounce of Pure Gold. PCGS CERTIFIED MS64. 37.5 GRAMS ORO PURO. MINT STATE UNCIRCULATED. NGC World Coins. Face Value: 50 Pesos. World Gold & Platinum Coins. Highest Grade 70 Coins. Weight: 1/2 oz. World Raw Gold Coins. World Silver Coins. Martin Weiss has been a leader in the numismatics hobby for over 40 years. 1921 Mexico Gold 50 Peso. KM-841 PCGS MS64. KM-841 PCGS MS64. 41.67 Grams of. 900 Gold. New York, NY 10022. BRIGANDI COINS & COLLECTIBLES. WE MOVED! Grade: NGC MS64 . Year/Mint: 1921. YEAR: 1821 / 1947. Top ten reasons to buy from Us! COLOR: GOLD. Money Back. SIZE: SEE PICTURE. International Included. WE ACCEPT. 1931 Key Date Mexico 50 Pesos Peso Gold NGC MS64 Free Ship KEY DATE!! 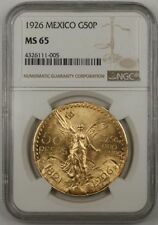 1931 MEXICO Gold 50 Pesos | NGC MS62 | Gold Buy It Now. Grade: NGC MS65. NGC World Coins. Face Value: 50 Pesos. World Gold & Platinum Coins. Highest Grade 70 Coins. World Raw Gold Coins. World Silver Coins. Martin Weiss has been a leader in the numismatics hobby for over 40 years. 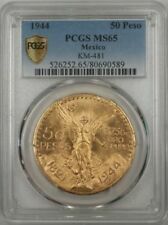 1945 Mexico 50 Pesos Peso Gold NGC MS65+ Free Ship NOT A RESTRIKE!! 1921 Key Date Mexico 50 Pesos Peso Gold NGC MS63+ Free Ship KEY DATE!! PCGS Certified MS63. As Pictured. Grade: NGC MS64. NGC World Coins. Face Value: 50 Pesos. World Gold & Platinum Coins. Highest Grade 70 Coins. World Raw Gold Coins. World Silver Coins. Martin Weiss has been a leader in the numismatics hobby for over 40 years. PESOS 1.2 oz. 37.5 GRAMS OF PURO GOLD NGC MS64. Grade: NGC MS63. NGC World Coins. Face Value: 50 Pesos. World Gold & Platinum Coins. Highest Grade 70 Coins. World Raw Gold Coins. World Silver Coins. Martin Weiss has been a leader in the numismatics hobby for over 40 years. THE COIN YOU SEE WILL BE THE EXACT COIN RECEIVED. The word ?peso? in Spanish means weight and is used to give money a name. Mexican gold coins are called pesos and are prized for their full weight of a single troy ounce. The mint agency of Mexico has coins going as far back as the 1800s, and you can bring them into your own personal collection. 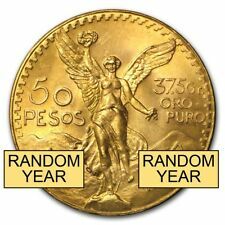 Are pesos collectible as bullion coins? Mexico has a large collection of gold coins that have spread throughout the hands of collectors worldwide. This occurs because of the value still held in precious metals. Precious metals are a group of the world?s rarest and most exotic metals that are turned into bars and coin rounds. This is done to commemorate a system that the world?s nations still hold themselves accountable to. It is called the gold standard and positions governments to circulate their own gold due to the value it has as a secondary currency. It is also the only currency accepted at face value by world governments and without a currency exchange. How much is the Mexican peso worth? Date: The time the coin was created is a large factor to how much people are willing to buy it for during an auction. Metal: Gold has a higher demand than silver, and the specific metal that pesos are made from will alter their value. Quantity: The quantity that a specific coin was made at is an indicator as well as how many are known to be still in existence. Where do Mexican gold coins come from? The Mexican Mint is an agency much similar to the mint of the United States. This agency issues coins for Mexico. The obverse face is important to understanding the origins of a coin and to find traces of a nation?s motto or mark.